MX-36 is a competitive mixed Judo match between Diana (5′ 9″, 154 lb, 23 yo, black belt) vs Bernard (5′ 9″, 198 lb, 48 yo, brown belt). Some fans have asked us to pair her up with an experienced stronger male after seeing her completely dominate Gregor in MX-31, and here it is. Bernard, who outweighs Diana by 44 pounds (20 kg), is the heaviest and strongest male opponent Diana has faced at Fight Pulse. 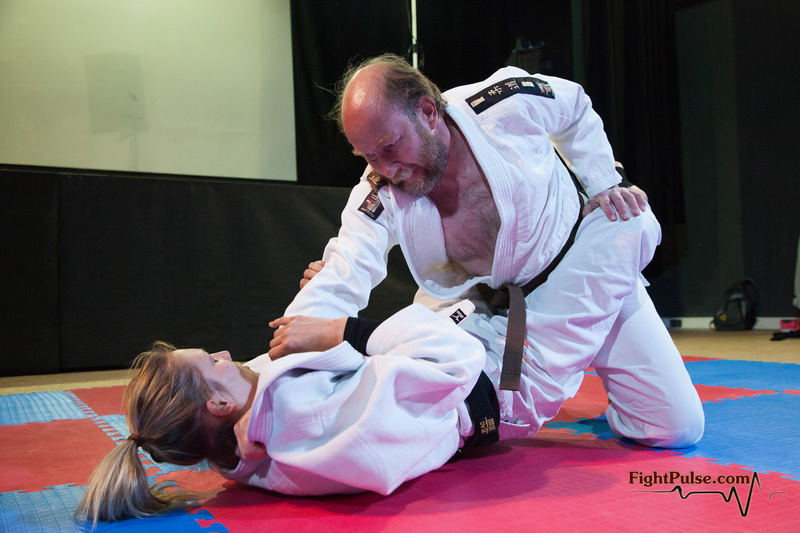 Not only is he extremely strong, but also he knows his grappling – Bernard is a Judo brown belt. We were always looking for an opportunity to make a competitive mixed Judo match that is not completely one-sided, and now we are proud to present it to you. Because we did not have experience filming such matches, this video is not without flows. First, the opponents had to start from their knees. We chose to film it this way because of the size of the matting, but also because in May, – when the shoot took place, – Diana was still recovering from her leg injury, and starting from feet causes a lot of strain on the legs. Second, since I am not very familiar with Judo rules, I had trouble understanding when to stand them up onto their knees, seeing that noone has advantage on the ground, so I tried to do it the way I do in our normal pins & submissions matches – I tried to give them about 30 seconds each time on the ground before asking them to resume on their knees. This does not conform to Judo rules, but is the best that I could do at the moment. Next time we film a competitive Judo video, we will definitely invite a Judo player to referee the match. Furthermore, our mats are less slippery than the standard Judo mats, thus they allow less maneuverability on the ground due to a strong friction between them and the kimono. Lastly, this video features only 2 submissions – very technical, beautiful, and hard-fought. We feel obliged to say this because our videos are generally full of pins & submissions – we frequently feature videos with 18 or more points on one side. That said, this is a must see for mixed Judo fans because there are few competitive mixed Judo videos around, and it is an intense and very technical encounter with lots of minute details and technical nuances that are not common in mixed wrestling matches. Match outline: introductory interviews, the match itself (20 min), final interviews.